Shukri Ibrahim, Producer of Queen of Sheba International’s debut play Arawelo discusses the warrior queen! Synonymous with female empowerment, warrior queen Arawelo (pronounced Caraweelo) is an ancient Somalian queen said to have ruled approximately in 15AD. Renowned for championing a matriarchal society, Arawelo, prior to assuming the role of queen would take on patriarchal roles such as gathering sustenance for her community. Laying the foundations for dismantling issues we still find ourselves talking about today, it’s a case of questioning the pace in which societies have moved forward. In a time where we are still discussing gender pay gaps and other inequalities, Arawelo’s defiant tenacity knows no end. Theatre Company Queen of Sheba International have taken on the powerful queen’s story in their eponymous production. Producer Shukri Ibrahim discusses the show’s development and timely issues. You’re currently producing a production of ARAWELO to show at the Rich Mix ‘London Somali Week Festival’. How are you feeling ahead of the event? I was so excited and proud of our performance at the Rich Mix as part of London Somali Week Festival. After having worked on ARAWELO for just over a year now, it is a little surreal that we performed at such a prestigious venue as the Rich Mix. 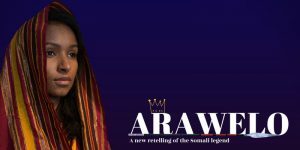 The production focuses on Somali Warrior Queen, Arawelo. What inspired you to create a show based on her? Queen Arawelo (Caraweelo in Somali), is such a controversial figure both in Somali folklore and in the Somali community in general. Her name alone is enough to spark debates and conversations on issues such as women’s issues and social structures. Within the Somali community, Arawelo has become an oxymoron of itself. Often, men would refer to a woman who is strong willed or outspoken as being an Arawelo. Whereas, women often refer to their daughters or role models as an Arawelo referring to the Queens boldness and strong character. It was then no brainer to choose to retell the story of this Warrior Queen, who hardly anyone from outside the Somali community have heard of. Furthermore, with all of the women’s related issues in the current climate, we thought sharing a story that shows a woman who has such weight and complexity would make for an enticing play. A scratch performance of the show was shown earlier on this year on International Women’s Day. What was the response towards the show? The positive feedback from the Scratch performance was overwhelming. We had many young women from the BAME community who said it was refreshing to see a play that tells the story in which they could feel represented, and that having a cast of all young female BAME actors on stage. At that time half of our cast had never been on stage before and ARAWELO was their time performing in a play to a sell out event. Parents who came with their children told us how much their children enjoyed the show and that for some it was their first time coming to see a live performance of a play. It was incredible to see that the majority of our audience were young BAME women under 30. Now a 60 minute performance, how did Queen of Sheba International develop the script? We actually started working on the script back in September of 2017. Our incredibly talented writer Demi Wilson-Smith completed the first full-length draft back in March. We workshoped and developed the script with her. For example, I played the role of ‘cultural editor’ and Poppy had an additional key role as editor. We did lots of reading and talking to the Somali elders in our efforts to collect the numerous versions told in Somali folklore. Though Demi is not of Somali heritage and it was her first time hearing of Arawelo; she has done research into the stories and has done an incredible job at representing Arawelo as a complex character. Furthermore, for those who come to see the play you will see just how well-thought out every character is. She wanted to do the story just and to reflect in the script that we were telling a version of the story and in no way claiming our version was the real deal. This gave us a lot of room for creativity whilst also maintaining true to the folklore traditions. We also included modern scenes that help to connect our audience to the ancient story. These were developed by our director Poppy Clifford further. During rehearsals our company would have all these interesting discussions/conversations about ethnicity, identity, belonging, representation in performing arts, powerful women in their cultures etc. Poppy had the wonderful idea of using these conversations and working with them to create many of the devised scenes in the play. Though we had to adapt the length of the play for Somali Week, we hope to bring them in to our future productions of ARAWELO. Expect to see a more rounded, and complex incarnation of Queen Arawelo. We have put in a lot of love and effort to ensure that ARAWELO the play is high quality theatre performance. We have gone all out, and worked to the best of our ability as a production team to put on a performance that will leave the audience wanting more. Often, when people hear of community productions, high quality is not the first thing that comes to their mind. We hope that this production shines some light on to other works that are similar in scale to ours but have excellent quality. What would you like for audiences to take away from the show? That representation matters in the stories we consume. There are thousands of stories like that of Arawelo that when told will enrich the diversity and culture of London even more. There are many artists working on projects such as ours, please go and support them. It is well know that there is little money in small performing arts companies, go see a show or two and if you can’t share their work. The International Women’s Day event, as well as the Somali Week Festival at the Rich Mix celebrates the works of Somali artists both nationally and internationally. At present, do you feel that there are enough arts opportunities for Somali artists within the UK? There are many opportunities for Somali artist in the UK. However, more can be done about the narratives that are told of the Somali community in general, I feel that as a Somali, the stories told lean way too much on the negatives. Positive and empowering stories such as the one we are telling through our play hopefully will inspire more Somalis in the creative industry to tell their stories and that people are keen to hear of rich stories that create bridges and unit communities. Don’t think of what you can’t do, or what others have not been able to achieve. I have never produced a play before (I’m more an art & design girl). But, I knew that the story of Arawelo needed to be told in such a way that anyone could enjoy, and theatre is such a platform. All you need is determination and rough idea. Surround yourself with people who will support you and also believe in you AND your idea. Then go and make it happen.